Heinemann (Txt). Used - Good. Ships from the UK. Former Library book. Shows some signs of wear, and may have some markings on the inside. 100% Money Back Guarantee. Your purchase also supports literacy charities. Heinemann (Txt), 1969-06. Paperback. Good. Westport, Connecticut, U.S.A.: Heinemann. Wraps. 0435900617 near Fine books carefully packed and shipped promptly . Fine. 1969. London: Heinemann Educational Books, 1969. Hard bound, orange and black laminated boards, first edition, 139pp. Ex-library copy in very good condition. 220 grams - ships lettermail. Number 61 of the African Writers Series. All books in stock and available for immediate shipment from Winnipeg, Manitoba. Westport, Connecticut, U.S.A.: Heinemann Educational Books Ltd., 1969. Slight cover wear. Nice, clean, tight, unmarked copy. 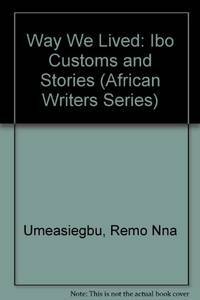 The customs and folklore of Nigeria. Fascinating.. Small Softcover. Very Good. Heinemann. PAPERBACK. 0435900617 Like New Condition. . Fine. Heinemann. PAPERBACK. 0435900617 New Condition. . New. 2002-03-07. Good. Ships with Tracking Number! INTERNATIONAL WORLDWIDE Shipping available. May not contain Access Codes or Supplements. May be ex-library. Shipping & Handling by region. Buy with confidence, excellent customer service!